Join Cole, Jay, Kai, Zane, and Nya in their latest adventure across the exciting land of Ninjago. New enemies are rising-does the team have what it takes to defeat them? LEGO® NINJAGO™: Team Ninja features brand-new LEGO NINJAGO 2016 minifigures and sets. Jump straight into the heart of the action as Sensei Wu's brave pupils embark on an epic new adventure. 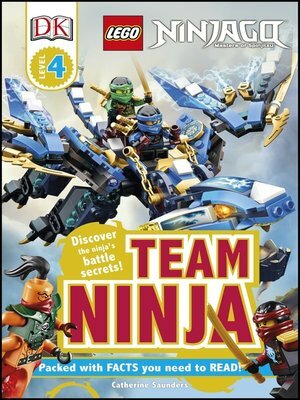 Combining DK's four-level reading scheme with the popular LEGO NINJAGO theme, LEGO NINJAGO: Team Ninja is at Level 4 and will help kids learn to read-and to love reading. Reading becomes a fact-discovering adventure with these engaging nonfiction chapter books for children confident in reading independently. Supporting and encouraging a lifetime love of reading, subjects are clearly explained, described vividly, and brought to life with true encounters, fascinating statistics, and dramatic photographic images. Additional information spreads are full of extra fun facts, developing the topics through a range of nonfiction presentation styles, such as articles, journals, and timelines. LEGO, the LEGO logo, NINJAGO, the Brick and Knob configuration and the Minifigure are trademarks of the LEGO Group. © 2016 The LEGO Group. Produced by DK Publishing under license from the LEGO Group.